We can form a train track on a torus by taking two essential loops in the torus that intersect once, then smoothing the intersection, as in the Figure below. (I’m drawing the torus as a square with opposite sides identified.) There are two possible ways to smooth the intersection, and for now we’ll just arbitrarily pick one. (Later on, we’ll come back to look at the difference between the two smoothings.) The resutling graph isn’t a train track, bit we can turn it into a train track by taking a regular neighborhood of it, then giving the neighborhood a foliation by intervals perpendicular to the original graph. The original graph (shown in the middle of the Figure) is called a train track diagram. There are many other loops in the torus, in addition to the red and blue loops above, that are carried by this particular train track. Examples with slopes , and , respectively, are shown in red in the Figure below. All these loops have positive slopes, and in fact, you can see that no arc from the left side of the square to the bottom of the square can be carried by this train track. So this means that this train track can only carry positive slopes. On the other hand, we can put in as many copies of either the vertical or the horizontal arc as we want. We can also put in as many arcs as we want from the left side to the top side, and the same number from the bottom to the right side. By choosing the number of such arcs carefully, we can get the intersections between the resulting loops and the sides of the squares to be whatever we want. (If the number of intersections with the top is greater than the number with the bottom, we’ll only use vertical arcs. Otherwise, we’ll only use horizontal arcs.) So, every loop with positive slope will be carried by this train track. To make it clear, let me summarize what we’ve learned: The train track that we constructed carries all the loops with positive slopes, as well as the loops with slope 0 and . Going back to the beginning of the post, note that if we had chosen to smooth the intersection between the original two loops in the opposite way, the resulting train track would have carried all the negative slope loops, as well as 0 and . So, we can think of a train track as a way to separate the loops in a surface into two different classes: the loops that are carried and the loops that aren’t. One way that this gets really interesting is when consider what these two classes look like in the curve complex for the surface. This approach is one of the main tools used in Masur and Minsky’s work on the curve complex , particularly their proof that curve complexes of surfaces are Gromov -hyperbolic. Recall that the curve complex for a surface S is the simplicial complex whose vertices represent isotopy classes of essential, simple closed curves in S and whose faces span sets of isotopy classes with pairwise-disjoint representatives. The curve complex for a torus is pretty boring: Any two disjoint essential loops in a torus are parallel (and thus isotopic) to each other, so there are no edges in this curve complex- It’s just an infinite collection of discrete vertices. So instead, one generally works with the Farey graph for the torus. Much like the curve complex, the vertices of the Farey graph represent isotopy classes of essential loops in the torus. 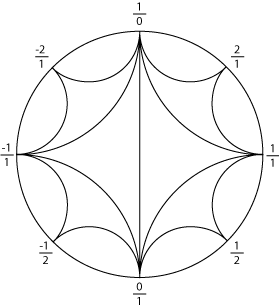 In particular, each vertex represents a rational number (a slope) including , and in fact we can arrange the vertices in order by slope along a circle. Since there are no pairs of disjoint loops, we connect any two vertices representing loops that intersect in a single point. Similarly, we include in the Farey graph all the triangles bounded by loops of three edges. I’ll leave it as an exercise for the reader to check that for every pair of loops in the torus that intersect in exactly one point, there are exactly two other loops such that each of these loops intersects each of the original two loops in a single point. (The two new loops will intersect each other in two points.) So, in other words, each edge in the Farey graph is in the boundary of exactly two triangles. This tells us that the triangles form a surface. In fact, the surface that they form is the disk bounded by the circle along which we placed the vertices in the previous paragraph. Notice that the triangles in this picture are different sizes, and in fact they get smaller as the numerators and denominators get bigger. But in reality, the edges of the Farey graph should all be the same length. So, you should think about this circle like the boundary of the hyperbolic plane, and the triangles as being ideal triangles. This isn’t exactly right either, since the edges in the Farey graph have finite length, unlike the edges of ideal triangles. But the Farey graph will have the same symmetry group as a tesselation of the hyperbolic plane by ideal triangles. The Farey graph is closer in structure to a tree. In fact, we can construct a tree by putting a vertex at the center of each triangle and connecting two vertices whenever the corresponding triangles share an edge. The Farey graph will be quasi-isometric to this tree (though if you don’t know what quasi-isometric means, don’t worry about it.) In the same way that each edge in a tree cuts the tree into two separate trees, each edge in the Farey graph cuts the Farey graph (which is really a cell complex) into two disconnected sets of triangles. Now, lets go back to the train track from the beginning of this post. Recall that the set of loops carried by the train track consisted of all loops with positive slopes, as well as the loops with slopes 0 and . These loops make up the right half-circle of the Farey graph. In particular, the subcomplex of the Farey graph spanned by the loops carried by this train track is exactly one of the two components that we get if we cut along the edge spanned by 0 and . The point of all this is that the different train tracks on the torus can be thought of as defining all the different ways of cutting the Farey graph along single edges. Train tracks in higher genus surfaces play a very similar role, though it’s more complicated because the curve complexes of these surfaces are much less tree-like (though they’re still delta hyperbolic, which is close.) In particular, you can’t separate these complexes by removing a single edge, or indeed any finite collection of simplices. But train tracks still define subsets of loops that are very nice with respect to the curve complex structure. The reason this turns out to be useful is that it is often possible to prove things about the types of loops that are carried by a given train track, which can then be translated into the language of the curve complex. This is one of the main techniques in Masur and Minsky’s papers on the curve complex , and on disk sets of handlebodies . It also proved very useful in my work with Yoav Moriah  and his earlier work with Martin Lustig . But a discussion along those lines will have to wait for a future post. Isn’t the set of loops limited to slopes m/n; m,n ∈ (0,∞) with at least one of m,n = 1 ? For example, I don’t think that the trefoil (3/2) could be carried by that track. Right, something like ╝│╔ would of course work here for 3/2. Sorry about the noise.